Now that UFC 149 has mercifully come to its conclusion, it’s time for the planet’s premier mixed martial arts promotion to put that lackluster pay-per-view broadcast in their rear-view mirror and focus on their next event. Of course, no Octagon show is complete without its very own billboard. 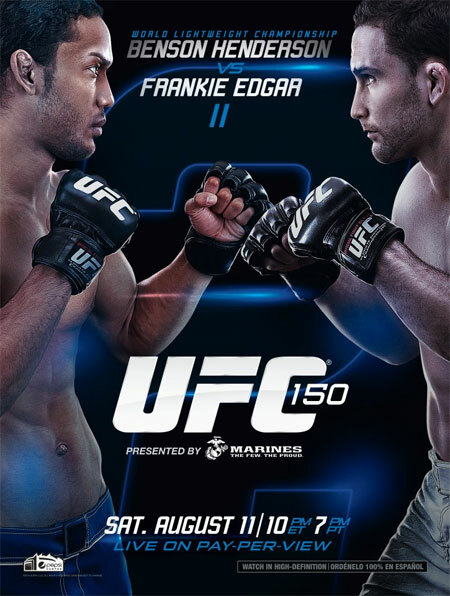 “UFC 150: Henderson vs. Edgar II” takes place August 11th inside Pepsi Center in Denver, Colorado. A lightweight rematch between champion Benson Henderson and Frankie Edgar headlines the bash. Speaking of 155-pounders, Donald Cerrone and Melvin Guillard serve as the night’s co-featured attraction.